WITH LEADING VIDEO AND STILL PERFORMANCE POWERED BY TRANSLUCENT MIRROR TECHNOLOGY. 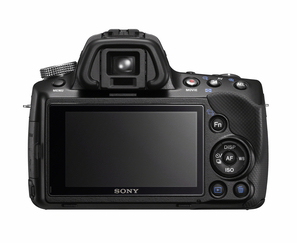 SAN DIEGO, June 8, 2011 — Light, compact and easy to use, Sony’s new α35 (SLT-A35) interchangeable lens camera brings pro-style shooting speeds and diverse creative options to photographers of all abilities. Building on the acclaimed α33 and α55 models, the α35 camera with Sony’s Translucent Mirror Technology allows responsive, accurate continuous autofocus – whether shooting high-speed still photos or recording full HD movies. Making its debut on the α35 camera, Tele-zoom High Speed Shooting magnifies a central portion of the image area providing an effective 1.4x magnification (appx) while shooting at up to 7 fps. Providing continuous tracking autofocus of still or moving objects, this feature is ideal for capturing fast-moving sports, children’s expressions at just the right moment or distant subjects with a high-speed burst of frames. There’s also a rapid up to5.5 fps drive mode that offers full-resolution continuous shooting with tracking AF. With a resolution of 16.2 effective megapixels, the Exmor™ APS HD CMOS sensor delivers stunningly detailed, low-noise still and HD video images. Complementing the sensor’s extremely high resolution and sensitivity, the camera’s powerful BIONZ® processor optimizes image data to assure flawless images with rich, natural color reproduction. A maximum sensitivity of ISO 12800 and extension to ISO 25600 makes it possible to capture beautifully natural still images and HD video in low light. Shooting stills or AVCHD™ video, users can enjoy a superbly detailed view on the high-quality 3-inch Xtra Fine LCD™ display. Sony’s TruBlack™ technology assures high-contrast images with rich, deep blacks – even when shooting outdoors. The high-resolution Tru-Finder™ display offers a precision alternative to framing shots on the camera’s LCD. Offering an extremely detailed, high contrast image with full 100% field coverage, it’s ideal for live preview of picture effects and exposure adjustments. Accurate composition of landscapes, architecture and other scenes is enhanced by 3 selectable grid line patterns. The α35 model offers a new in-camera ‘Picture Effect’ setting that lets users add extra impact to stills or Full HD video during shooting, without the worry of editing images afterwards. Effects can be previewed on the camera screen, allowing photographers to see the result of a chosen effect instantly rather than post-shooting. The inspiring palette of artistic treatments includes Retro Photo, High-key, Toy Camera and Posterization. It’s also easy to produce dramatic Partial Color effects, with a single color highlighted against the rest of the image in monochrome. This popular effect is normally achieved through a series of painstaking steps using photo editing software. With the new α35 camera it’s both automatic and instant. Reductions in power consumption boost the camera’s battery life to a generous 440 still shots (approx. when using the rear LCD panel) between battery charges – a 30 percent increase over its predecessor. The new camera is compatible with Sony’s full line of SD memory cards, including the newest Class 10 versions, as well as the Memory Stick PRO-HG™ Duo HX series. Available in capacities up to 32 GB, both media enable higher read speeds for more stable and optimal performance by Sony hardware features such as high-speed burst shooting or HD movie shooting. 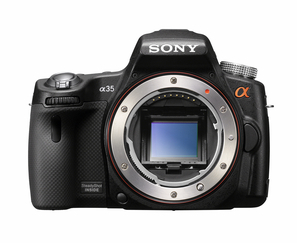 Support for the ‘Picture Effect’ function featured on the new α35 model is now offered. 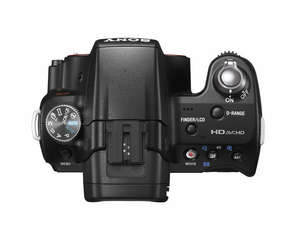 High-Speed Synch is supported during wireless operation with a compatible external flash (α55 only). Ergonomics are further improved with revised menus and a new mode that lets users switch shooting parameters overlaid on-screen for clear, uncluttered composition. The a33 and a55camera’s Digital Level Gauge can also be displayed when shooting via the optional CLM-V55 external LCD monitor. Frequently used features can now be custom-assigned to the D-RANGE button for rapid, menu-free access. The new α35 interchangeable lens camera will be available this August with an 18-55mm kit zoom lens (model SEL1855) for about USD$700. It will also be offered as a body-only (without kit lens) for about USD$600. Both the camera kit package (model SLT-A35K) and body-only (model SLT-A35) will be sold at Sony retail stores (www.sonystyle.com) and other authorized dealers nationwide. 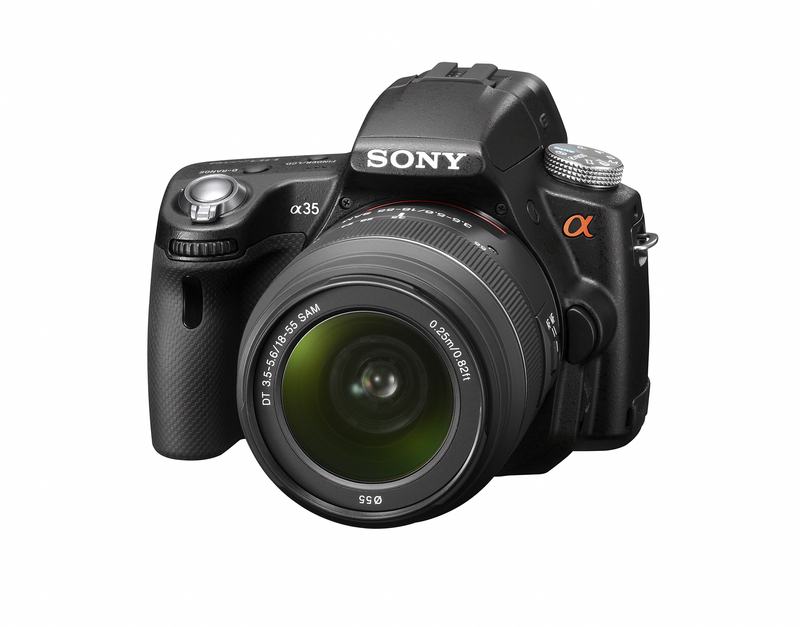 This entry was posted in Brand: Sony, Photography Articles & Videos and tagged Alpha, DSLR, Sony. Bookmark the permalink.